“There is safety in numbers.” Your mother taught you that axiom of life before you went off to school. That basic tenet, with a little alteration, can be adapted to the game of basketball. Clemson Coach Larry Shyatt hopes the word safety translates to the word victories in 2000-01. Throughout the 1999-00 season, Shyatt quite simply did not have numbers, that is numbers of players to compete for victories for much of his 30-game schedule. With four preseason operations and many other injuries, at times Clemson had more scholarship players on the sidelines than on the court. But, 2000-01 is a new season, and with it the forecasts for a healthy season. Shyatt enters the academic year with 12 scholarship players, most of which are healthy, or at least on the road to a healthy beginning of the season. Clemson returns nine lettermen and four starters from last year’s 10-20 team that defeated South Carolina for the sixth straight year, N.C. State (twice), plus wins over Georgia Tech and Florida State. The contingent of returnees includes All-America candidate Will Solomon and starting center Adam Allenspach, the only senior on this year’s squad. Forward Chucky Gilmore and guard Edward Scott are two more returning starters for 2000-01, but Gilmore will miss the season due to injury. Shyatt must replace Andrius Jurkunas, who was a part of three NCAA Tournament teams and an NIT Finalist at Clemson. He graduated as the school’s career leader in three-point goals by frontcourt players. The Tigers will need players to step up and take the pressure off of Solomon, who at times had to do everything from scoring to passing to defending to rebounding to selling programs. “We have two returning experienced players at important positions, one inside and one outside,” continued Shyatt. “Will was a first-team All-ACC player as a sophomore, the first Clemson sophomore to do that in 25 years. Adam is a solid player on the inside with three years of experience under his belt. He was among the league leaders in rebounding. “But, we need that third and fourth consistent double-figure scorer who will make a difference in the other areas as well. Will was required to do too much last year. His scoring average may go down a little, but hopefully his field goal percentage will go up because he will be surrounded by healthier teammates. Certainly, Clemson will be more experienced. Shyatt enters a season in which players return who accounted for 83 percent of the playing time, 86 percent of the field goals, 85.5 percent of the points, 82.5 percent of the rebounds and 81 percent of the assists. While the Tigers look to be improved, so will the rest of the ACC. The top six teams in the 1999-00 league standings return 27 of their 30 starters. Eight of the ACC’s top 10 scorers return and nine of the league’s top 10 rebounders are back. Five players who have been first-team All-ACC in their careers, including Will Solomon, return. Backcourt The leader of the Clemson backcourt is 6-1 guard Will Solomon. 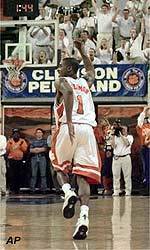 Solomon had one of the most outstanding seasons in Clemson history in 1999-00, and it resulted in his selection to the All-ACC first-team, the first Tiger in 10 years to be ranked among the top-five players in the league. Solomon averaged an ACC-best 20.9 points per game, a figure that ranked 16th best in the nation. He received notoriety for his ability to score from the outside (93 three-point goals and a 40 percent accuracy rate in league play) and his ability to penetrate and score in the lane against taller opponents. Solomon had a higher scoring average in ACC games than in non-league games last year and was the only ACC player to score in double figures in every game last year. “Will Solomon had an incredible season for us last year,” said Shyatt. “He did more than just score, he led us in assists, playing time, had a strong year on defense and was a strong rebounder. Scott had an injury plagued freshman year, but, when he was healthy in the second half of the season, he showed an ability to run Clemson’s offense with maturity. He finished the season averaging one turnover every 14.5 minutes of play. Scott averaged 6.5 points per game, fourth best on the team. He started 21 of the 30 games and played in 24 overall. An ankle injury kept him out of six games and limited his effectiveness in six others. Another player who will see significant playing time in the backcourt is freshman Tony Stockman, one of the most highly recruited players in years to sign with the Clemson program. Co-Mr. Basketball in the state of Ohio, Stockman averaged 25.5 points and 5.4 assists per game for Medina High School in Medina, OH last year. Stockman was an 84 percent free throw shooter and finished his career as the school’s all-time leading scorer with 1211 points. He participated in the Capital Classic after his senior year and was also selected to the Wendy’s Big Four Classic. Pasha Bains is a third returning player with starting experience in the backcourt for Shyatt. Bains played in 22 games, four as a starter last year, after transferring from Wyoming. The native of Canada led the team in free throw shooting and averaged 5.7 points per game. Walker Holt is a fourth returning letterman in the backcourt. The native of Greensboro, NC played in 26 games and tallied 34 points and had a 20/12 assist/turnover ratio. Three players on Shyatt’s roster would be considered guard/forward players. Their ability to play multiple positions is certainly a plus for the 2000-01 Tigers, giving the Clemson coach many options. Braddick averaged 4.9 points a game and pulled in 4.3 rebounds a game in 24 contests, nine as a starter, last year. Newcomers Dwon Clifton and Jamar McKnight are agile 6-5 players who should bring Clemson an athleticism the team has been lacking in recent years. “We need to improve our perimeter shooting and our ability to create off the dribble. We must be able to put more pressure on opposing defenses and show improvement when it comes to ball handling and passing. “Dwon Clifton has tremendous explosiveness and athleticism, something we have lacked in recent years. We have not had a big guard who could take people off the dribble and, at the same time, have great range. He could also become a great defender because he moves his feet well for a 6-5 player. Clifton averaged 21.1 points and 8.4 rebounds a game his senior year of high school and was a first-team Associated Press All-State selection. His senior year he led Westchester Academy to a 28-2 record and the state championship. McKnight averaged 20 points and six rebounds a game for Northwest (MS) Community College in 1999-00. He connected on 79 percent of his free throws, 52 percent of his field goals, including 39 percent from three-point range. He was named an all-state and all-region team member. Frontcourt Clemson has four players, including three returning lettermen and one starter, who would be considered pure frontcourt players. Obviously, some of the aforementioned backcourt players can see playing time at forward positions. Adam Allenspach is the only returning starter at the center and power forward positions, though Ray Henderson saw significant playing time at both positions during his freshman season. Tomas Nagys saw time as a small forward and power forward last year, but has gained 25 pounds of muscle for his sophomore year. Chris Hobbs is a first-year freshman who should also see significant playing time inside. Chucky Gilmore tore his ACL during the summer and is out for the year. “Our interior is an intriguing group because we have players who can score inside and out. Adam Allenspach have shown they can hit the mid-range jumpshot. Plus, we have the size and strength on the inside that has been a characteristic of Clemson teams the last few years. Allenspach is Clemson’s only senior. The native of Parkland, FL was second on the team in scoring with an 11.4 average and ranked eighth in the ACC in rebounding with a 7.1 figure. Allenspach shot 74 percent from the foul line last year, the best by a Clemson center in 41 years. The 7-1 player had off-season back surgery that limited his play over the summer, but he should be ready to go for the start of preseason practice. Ray Henderson showed much promise in limited time last year. The 6-8 sophomore battled knee injuries, a groin injury and a chest injury in his rookie year, allowing him to play just 12.4 minutes per game. But, in that limited playing time he showed an innate ability to score via some head-turning post moves not seen in Tigertown since the days of Sharone Wright. Henderson led the team in field goal percentage with a 53 percent mark and he averaged 3.9 points per game in that limited playing time. Chris Hobbs missed 90 percent of his senior year at East Chapel Hill High last year due to a torn ACL injury. But he worked in Clemson this summer to get into condition to face the rigors of the ACC schedule. “Chris has the ability to catch and shoot. We think he will help us this year at both interior positions. His ability to come back from the injury will dictate how much time he can compete.” Hobbs averaged 20.1 points and 11.8 rebounds a game when he was first-team All-State in 1998-99. Tomas Nagys was a 210-pound small forward last year who averaged 2.6 points and 2.4 rebounds per game. A near 70 percent free throw shooter, he also led the squad in charges taken with 12, even though he played just 7.7 minutes per game.